St. Nicholas Collegiate Church was known originally as the Fifth Avenue, or Forty-eighth Street, Church. The first building was erected in 1847. In 1872, a new church was built on the same site. Designed by W. Wheeler Smith and built from 1869-72, its exhuberant Gothic architecture was marked by a disproportionately large steeple, flying buttresses, and a gabled roof. Theodore Roosevelt and his family occupied Pew No. 39. Following World War II, the property had greatly increased in value and was desired for the expansion of Rockefeller Center. 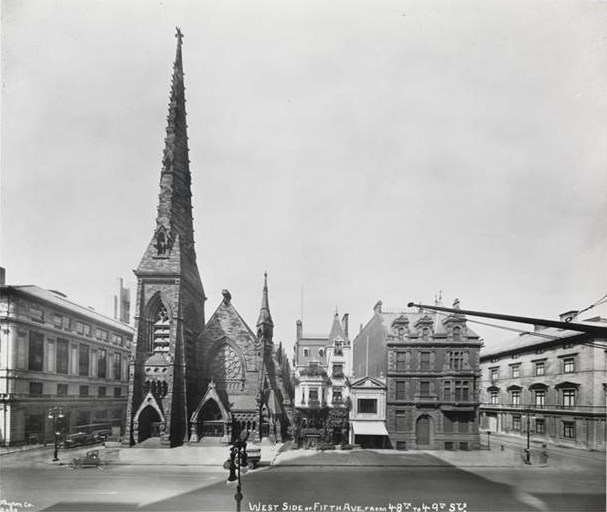 Despite initial assurances from the Collegiate Corporation that St. Nicholas Church would not be sold, the building was ultimately demolished in 1949, and the land leased to Rockefeller Center. Specifications of this organ have not yet been located. In 1914, the Hutchings-Votey Company rebuilt the 1899 Odell organ. Hutchings-Votey provided a new four-manual, batwing-style console. The following specification was recorded by F.R. Webber, whose "Organ Scrapbooks" are in the possession of The Organ Historical Society Archives in Princeton, N.J. In the construction of this instrument the problem to be solved by the builders was to obtain a quality of tone that would fill the large building in which it is placed, without appearing rough or boisterous to the listeners; and to accomplish this the largest scales throughout the organ have been used, avoiding anything like forced voicing, and the result has been successful. It is not so powerful as others of the same class, but there is in the tone a mellowness that amply compensates for the power lost. The entire instrument is located in a chamber that was, we believe, specially constructed for it. The bellows is located in a room above the organ chamber, and distant twenty-five feet. This necessitated the use of additional wind reservoirs, placed immediately under the chests to obtain steadiness of tone. Every register in the organ extends throughout the entire compass, and all the metal pipes from a four-feet length are of forty-five per cent tin and fifty-five per cent lead. The case is of a design strikingly beautiful and novel, full in keeping with the architecture of the church, which is one of the most substantial and costly that has ever been constructed in this country. "Collegiate Church Split By Defection of St. Nicholas Unit," The New York Times (Jan. 3, 1947). "St. Nicholas Group Has Final Meeting," The New York Times (Jan. 15, 1947). "St. Nicholas Organ As It Was Rebuilt,"The Diapason (Apr. 1, 1914). "The Organ," New York Weekly Review (Dec. 28, 1872). Specifications of Labagh & Kemp organ (1872). Courtesy Larry Trupiano. Webber, F.R. "Organ scrapbook" at Organ Historical Society Archives, Princeton, N.J. Stoplist of J.H. & C.S. Odell organ, Op. 368 (1899). Courtesy Jonathan Bowen. Byron Company (New York, N.Y.). Photo (1923) of exterior. The Diapason (Apr. 1, 1914). Console of Hutchings-Votey organ (1914). Courtesy Jonathan Bowen. Lewis, James. 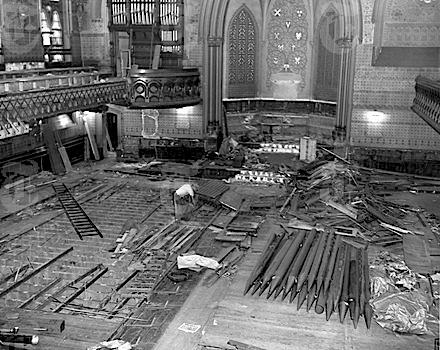 Photo (1949) showing dismantling of organ and church interior.